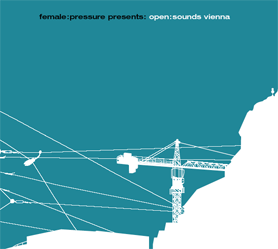 In May 2005 open:sounds was created as an online-platform for the female:pressure community [female:pressure is an international database for female artists in the fields of electronic music initiated in 1998] to exchange sounds and remix each others' tracks. Under the terms of the liberal creative commons license attribution-noncommercial-share alike, members of the community may freely use the musical material for new productions and remixes. With this project we hope to stimulate and show-case the creative potential of the approximately 800 artists from 46 countries, that make up the female:pressure community. Our goal is to cultivate the exchange of ideas and sounds and raise the visibility of female creations in the seemingly male dominated fields of electronic music. To the public the finished tracks will be made available under the more restrictive creative commons' music sharing license attribution-noncommercial-no derivatives. This license permits redistribution, but prohibits commercial and derivatives uses. Catarina Pratter was born, lives and dies in Vienna, city of Kaiserin Sissi and Cheap Records, where she had her first release with her electronic band 550rondy. In Vienna time is passing slowly, so she doesn't know if really happened a lot since she started making electronic music in 1996: there are 2 solo vinyls on the Berlin label SueMi one on "4women no cry" on Gudrun Gut's label monika enterprise and - again with her wonderful rondy-boys - a full length album on temp~records called "My Critical Hertz". She produces radio shows and radio plays and has started to make music for theatre plays. chra, Christina Nemec, musician, DJ, author, student. member of the performance band SV DAMENKRAFT and the "rockband" mopedrock!!. She works solo as chra with soundeffects, Logic, Ableton Live, tape recorder, bass guitar and "miscellaneous junk"..... she loves to play with/at radio (orange) and television (okto). Dunja, a dedicated musiclover, started as a dj in 1999 playing acid, detroit- und minimaltechno. Later, she extended her style and now includes electro, ghetto bass and wierd tunes too. With the knowledge based on her djing skills, Dunja now works as an editor (electro) for the webchannels of the webradio play.fm. Electric Indigo, DJ and musician, has rocked clubs and raves in more than 33 countries. 1998 marked the beginning of her DJ-carrier, she lived in Berlin form 1993 to 1996 when she moved back to Vienna. 1998 she initiated female:pressure, 2003 she started her record label indigo:inc recordings. irradiation has been an inherent part of her native city Vienna's music scene for quite a while. Over the years, she has developed her sound significantly and - leaving her former break style behind - now produces her own definition of minimal club sound that she also performs live. Additionally, irradiation is head of of temp~records and organizes the temp~festival. June, DJ since 2000, resident DJ at the Club Shake Baby Shake diploma for electric guitar in 2002. Collaborations with bands like Mangold and Arth & Schalk as songwriter and instrumentalist. Longtime staffer at the "Werkstätten- und Kulturhaus" WUK. Ravissa started 1995 at the age of 15 as a techno and house DJ. In the following years she extended her musical range to minimal, ghettobass and uk garage (grime). In 2001 the new media artist Ravissa initiated the netlabel doorbitch, based on an independent network of sound and design production, embedded within a both social and technological context. Shroombab is a drum&bass and breakz DJ and producer living in Vienna. She is the founder of Junglistic Sistaz and owns a record label named High Tension Recordings. Additionally, her productions got signed to various labels, because of their unique style. ako [Silvia Fässler], works a.o. as music programmer and curator (e.g. rhiz), used to be drummer of the the rock trio "8 Finnen", later turned towards electronic music. Performs solo or together with Billy Roisz as "silly". Collaborations a.o. with Manon Liu-Winter, Cordula Bösze, Klaus Filip, Otomo Yoshihide, Arnold Haberl. gnu [Billy Roisz], specializes in feedback video and video/sound interaction. Using monitors, cameras, video mixingdesks, a selfbuilt videosynth, computer and turntables for video and sound generating. Member a.o. of NotTheSameColor (/w dieb13), AVVA (/w Toshimaru Nakamura) and silly (/w akoasma). Suetoyou, singer and producer since 2000, loves to collaborate with international artists using the platform funender. She also distributes her music through the net. Terra is a vocalist from Vienna who co-founded Junglistic Sistaz. She started to make music with live singing to drum'n'bass tunes, first productions followed soon. Terra is an artist who is influenced by most diverse musical styles and therefore varies her projects deliberately - for example her cooperations with the electro orientated live act Sub:stanz and the trip-rock bands LOX-P and Toybox. Tibcurl, DJ and fine artist, began mixing in 1998 and made her first attempts in Tokyo where she spent 6 months on an overpriced scholarship. Back in Vienna, she initialized "Electronic Resistance", a political riot formation featuring sound system demos against the Austrian right wing government. She was a radio editor at Radio FM4, moved to Berlin in 2003 and started her own friday club ICKE MICKE back in Vienna. Die 1998 gestartete Initiative female:pressure - eine internationale Datenbank für Frauen, die sich im Bereich der elektronischen Musik und Clubkultur betätigen und die zur Zeit rund 800 Künstlerinnen aus 46 Ländern beinhaltet - wurde im Mai 2005 um eine Soundbank zum gegenseitigen Austausch musikalischer Produktionen erweitert: open:sounds. Bedingung für die Nutzung von open:sounds ist die Übereinkunft, dass Soundfiles, die von den Musikerinnen online gestellt werden, allen Teilnehmerinnen zwecks Bearbeitung unter der liberalen Creative Commons Lizenz attribution-noncommercial-share alike zur Verfügung gestellt werden und dass die daraus entstehenden Musikstücke und/oder Klänge wiederum in die Soundbank zurückfließen. Die Intention des Projektes ist, das kreative Potential der Gemeinschaft zu aktivieren, den Austausch von Ideen zu fördern, einen alternativen Umgang mit Urheberrechten zu praktizieren und, im Sinne der Sichtbarmachung weiblichen Schaffens in einer scheinbaren Männerdomäne, der interessierten Öffentlichkeit die daraus entstandenen Werke unter der restriktiveren Creative Commons Lizenz: noncommercial-no derivative works-attribution zu präsentieren. Catarina Pratter, Klangchaotin, Rhythmiotin, pädiaphone Audionautin, Musikerin seit 1996, erster Release mit ihrer Elektronikband 550rondy auf Cheap Records, 2 Soloveröffentlichungen auf dem Berliner Label SueMi, eine auf "4women no cry" auf Gudrun Guts Label monika enterprise und - wieder mit ihren wunderbaren rondy-Boys - ein Album auf temp~records namens "My Critical Hertz". Sie produziert Radioshows, Hörspiele und auch Musik für Theaterstücke. chra, Christina Nemec, ist Musikerin, DJ, Autorin, Studentin. Mitglied der Performanceband SV DAMENKRAFT und der "Rockband" mopedrock!!. Solo arbeitet sie als chra mit Soundeffects, Logic, Ableton Live, Kassettenrekorder, Bassgitarre und "diversem Klumpert"..... spielt gerne mit/im Radio (orange) und Fernsehen (okto). Dunja, schon immer musikaffin, begann sich 1999 mit DJing zu befassen. Zu anfänglicher Begeisterung für Acid, Detroit- und Minimaltechno gesellte sich bald eine Vorliebe für Electro, Ghetto Bass und schräge Tunes. Ihr über die Jahre erworbenes Knowhow bringt sie seit 2005 auch in der Redaktion des Electrochannels beim Webradio play.fm ein. Electric Indigo, DJ, Musikerin, hat in über 33 Länder Clubs und Raves gerockt. Sie startete ihre DJ-Karriere 1989 in Wien, lebte von 1993 bis 1996 in Berlin und ist seit 1996 wieder in Wien ansässig. 1998 begann sie mit dem Aufbau von female:pressure. 2003 gründete sie ihr Plattenlabel indigo:inc recordings. irradiation ist schon länger fest in der elektronischen Musikszene ihrer Geburtsstadt Wien verankert. Sie hat im Laufe der der Jahre ihren Sound massiv weiterentwickelt und produziert nach früheren breakigen Ansätzen jetzt eine eigene Definition von minimalem Clubsound, den sie auch live umsetzt. Zudem ist sie Labelkopf von temp~records und Organisatorin des temp~festivals. June, DJ seit 2000, Residency beim Club "Shake Baby Shake", Diplom für E-Gitarre 2002. Zusammenarbeit mit Bands wie Mangold und Arth & Schalk als Songwriter und Instrumentalistin. Langjährige Mitarbeiterin im Werkstätten- und Kulturhaus WUK. Ravissa begann 1995 als 15-jährige Techno & House aufzulegen, seither erweiterte sie ihr künstlerisches Spektrum um Minimal, Ghetto Bass und UK Garage (Grime). Das von Ravissa initiierte doorbitch.nu Projekt basiert auf einem unabhängigen Netzwerk von Sound- und Designproduktion im Spannungsfeld eines technologischen und sozialen Kontextes. Shroombab ist eine in Wien lebende Drum&Bass- und Breakz-Produzentin sowie DJ. Sie gründete 2000 Junglistic Sistaz und besitzt ein Plattenlabel namens High Tension. Ihre Produktionen wurden außerdem auf verschiedensten Labels gesignt, da sie einen sehr eigenen Sound entwickelt hat. ako [Silvia Fässler]. Tätig u.a. als Musik-Veranstalterin und Kuratorin (z.B. rhiz), in den 90ern Schlagzeugerin des Rocktrios "8 Finnen". Hinwendung zur Elektronik, Auftritte u.a. beim Zeitfluss Festival / Salzburg, Unlimited / Wels, im Porgy&Bess / Wien, solo oder im Duo mit "silly" (mit Billy Roisz). Kooperationen u.a. mit Manon Liu-Winter, Cordula Bösze, Klaus Filip, Otomo Yoshihide, Arnold Haberl. Suetoyou, Sängerin und seit 2000 Produzentin, arbeitet gerne über die Plattform funender mit MusikerInnen unterschiedlichster Provenienz zusammen. Nutzt das Internet auch für den Vertrieb ihrer Musik. Terra ist eine Vokalistin aus Wien. Sie ist Mitbegründerin der Junglistic Sistaz, begann das musizieren mit live Gesang zu Drum'n'Bass Songs, danach folgten erste Produktionen. Terra ist eine Künstlerin, die ihre Einflüsse aus ganz unterschiedlichen Musikrichtungen schöpft und deshalb auch ihre musikalischen Projekte bewusst stark variiert, beispielsweise ihre Kooperationen mit dem elektro-orientierten Live Act Sub:stanz und den Trip-Rock Bands LOX-P und Toybox. Tibcurl, DJ und bildende Künstlerin, begann 1998 aufzulegen und unternahm ihre ersten Versuche vor Publikum in Tokio, wo sie 6 Monate wegen eines überteuerten Stipendiums verbrachte. Wieder in Wien initiierte sie "Electronic Resistance", eine politische Bewegung, die mittels Sound System Demos gegen die österreichische Rechtsregierung protestierte. Sie war Redakteurin bei Radio FM4, zog 2003 nach Berlin und betreibt seit ihrer Rückkehr nach Wien ihren eigenen Freitagsclub ICKE MICKE.